Saturday Snippets (A Day Late) – laps.lunges.leather. Last week, I mentioned that I had an anniversary coming up and that I’d be making Honey Chicken Chipotle Bowls from How Sweet Eats. I’m here to report that they turned out excellent! I had a little bit of mango salsa leftover from fish tacos earlier in the week, and this provided an extra bit of YUM to the dish. Also, instead of cooking the chicken on the stove, my husband threw it on the grill. This was perfect because it meant less clean up after dinner. 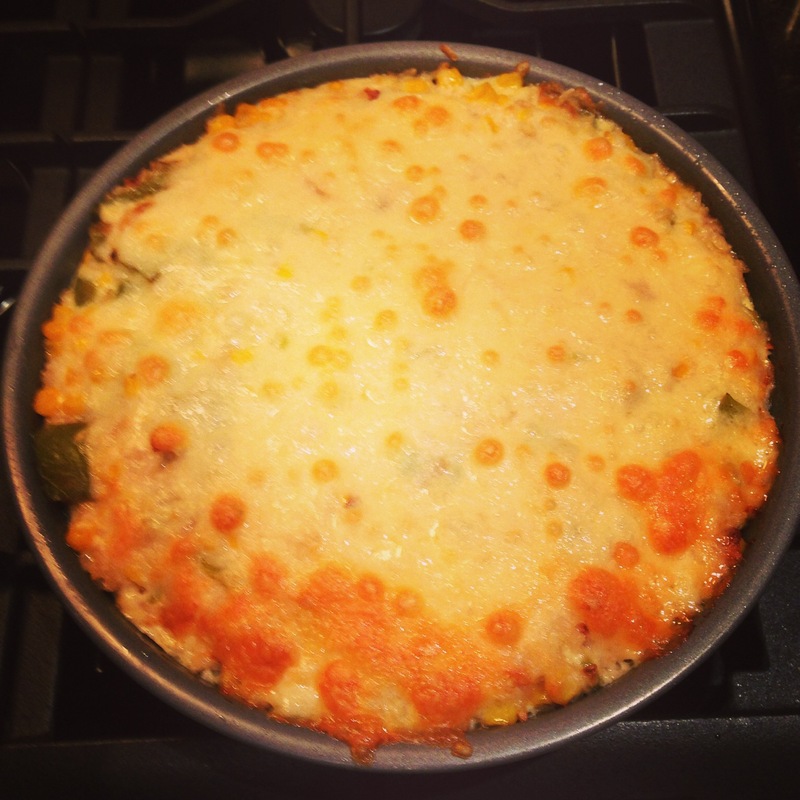 This dish was given the green light to make again (and not just by my man, but from our foodie friends too). 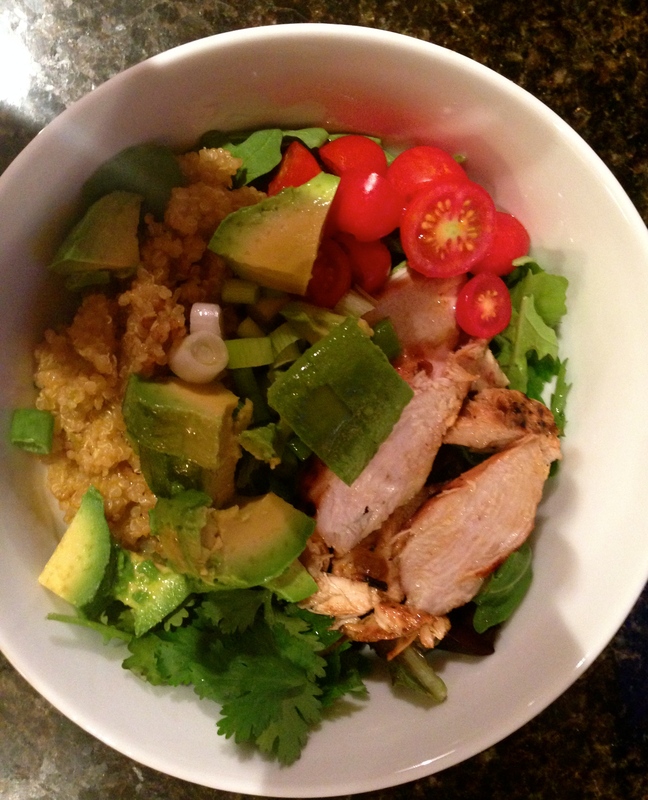 Honey Chicken Chipotle Bowl… my attempt! I made Classic Margaritas from one of my all time favorite magazines, Real Simple too. Adam looked at the pitcher and said, “That will never be enough!” I assured him that it would be plenty… we were all rather buzzed after one each. As predicted, I was right. I did double the batch and we used Patron Silver Tequila and Patron Citronge Extra Fine Orange Liqueur instead of Triple Sec (I can thank the kind man at Bevmo for that suggestion). And then… we had cake. 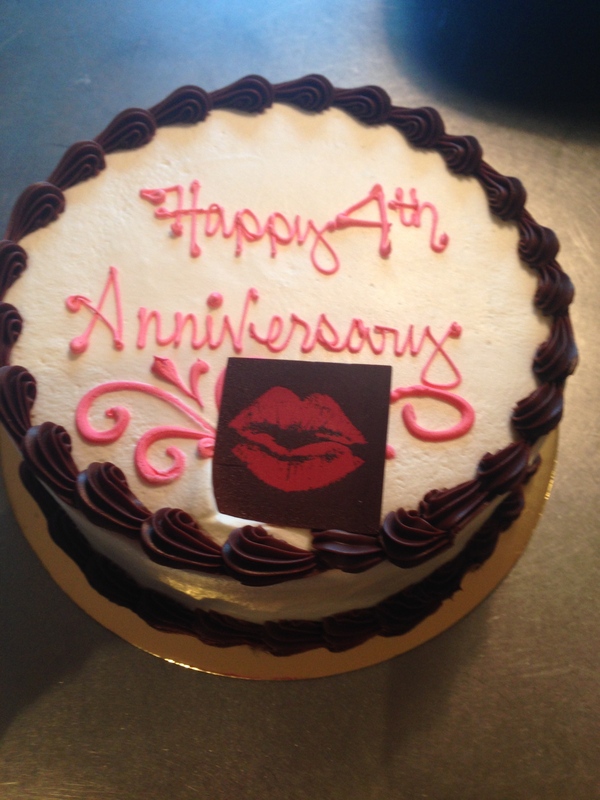 Chocolate Devil’s Food Cake with Whipped Cream frosting from The Buttery. Life is better with cake. Yes… I do indeed own an 8×8 casserole dish. I just couldn’t find it because I recently cleaned the cabinets and it was neatly stacked with the other casserole dishes… as it should be. I’ll use it next time. I can go without eating meat, but Adam likes to say “If we weren’t supposed to eat animals, then why are they made out of meat?” To remedy his need for meat, I put a couple of chicken breasts along with a jar of salsa verde into the crock pot before I went to the gym. He got his meat, and I got to have a delicious veggie meal. Two birds. One Stone. This dish was given 2 “OH WOWS!” That means you should make it. 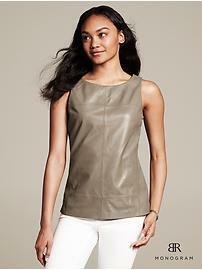 In the LEATHER department, Banana Republic has recently launched their new leather (and some fine looking faux leather) pieces. I’ve been on the hunt for a leather tank or t-shirt for a bit and was super stoked to see a leather tank and a faux leather tee in the line-up. We went to San Jose today to do a little shopping and I was hoping to try the them on, but they were not in the store yet. The sales girl thought BR would have these items on August 8th. If you are excited to see them or order before then, here’s a peek. I’m also hoping that BR will have one of their awesome coupons that includes either item. Do you ever get frustrated when you pick out that one item that is excluded from the too hard to believe percent off??? Yep… me too! Okay… last snippet. I have to go back to work this week, although I won’t have students for a couple of weeks. I’ve signed up to lead a few back-to-school trainings, and I also have to attend a few back-to-school trainings. It always takes me a bit to get back into the swing of things so I’m a huge fan of the pony. Lucky me, I have really thick hair, and with the help of a Keratin treatment, it is very easy to make a pony tail look polished. Unlucky me, thick hair is quite heavy and I almost always fail at the messy top-knot look… until now… check out this easy tutorial from Espresso & Cream. 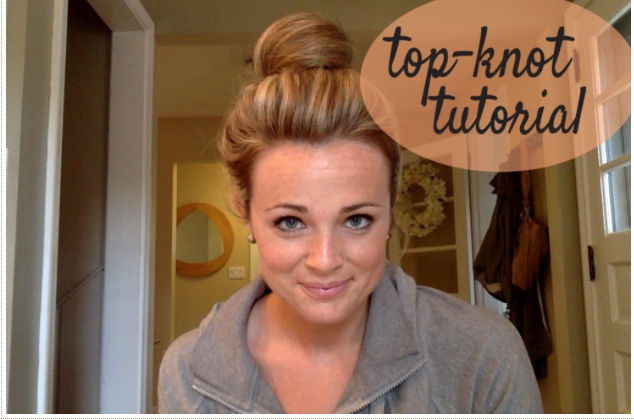 I was able to do it (albeit with a TON of bobby pins) so I’m sure it will work for you too! Hoping your Saturday (um… Sunday) is full of joy and the chance to do something extraordinary! Enjoy! Oh… and if you try any of the above out this week, let me know how it went! Absolutely! Whole Foods has organic corn options. I think everything I used was organic now that I think about it.